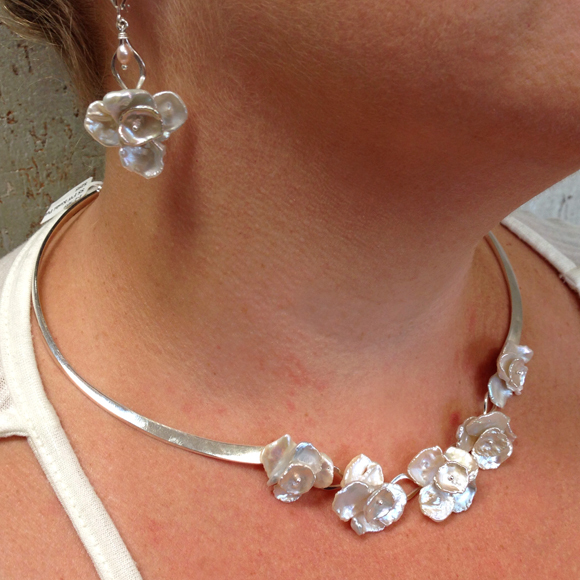 We’re proud to introduce “Pearl Blossoms”, the newest pearl fashions by Kaye Sweaney of Mardon. Kaye calls these “Pearl Blossoms” because they remind her of cherry blossoms and other flowers. These unique pieces are each made by hand from “Keshi” pearls from the pearl farms of Asia. Keshi are accidental pearls which spontaneously form as by products of pearl cultivation. Keshi are produced in both saltwater and freshwater pearl farms. Kaye saw these bright but irregular freshwater keshi pearls and fell in love with their soft luster and shifting colors known as “orient.” They reminded her of flower petals, so she went to work to develop a way to make her lovely “Pearl Blossom” jewels. After much trial and error, she was able to create these beautiful blossoms. You’ll find “Pearl Blossoms” only at Mardon Jewelers, the best jewelry store in Riverside. 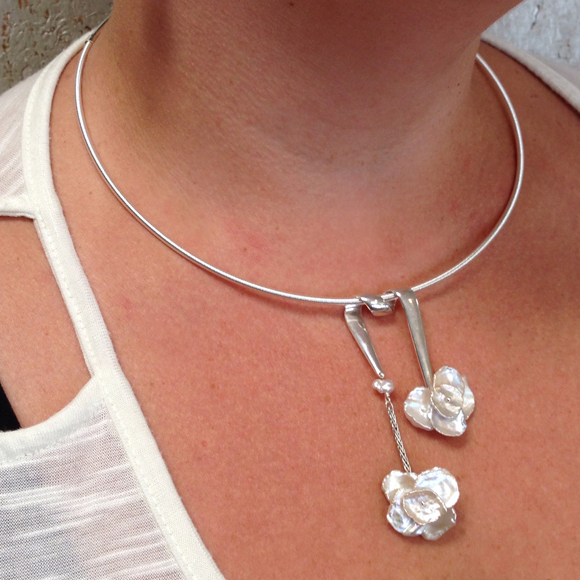 The Limited Edition earrings start at $75, the 5 blossom necklace is $295. If we don’t have exactly what you’d like, Kaye will be happy to make special blossoms just for you! Don’t forget that June is Pearl Month– Pearls, Moonstone, and Alexandrite are the birthstones for June. Pearl Blossoms are now on display at Mardon Jewelers at the Canyon Crest Towne Centre, 5225 Canyon Crest Drive, #14. It’s best to enter the center from the Central Avenue entrance– we’re the first store left of Rite Aid. We’re open Tuesday thru Saturday, 10 to 5:30. You can take the entire survey for all your choices for best local shopping, restaurants and services. For your ballot to count, vote for at least 25 categories — it’s easy and fun. And you can vote every day! Voting ends this Sunday, June 3. We thank you for your vote and support– this recognition inspires us and helps us keep going to bring you fine original pieces like Kaye’s Pearl Blossoms found only at Mardon Jewelers. This entry was posted on Tuesday, May 29th, 2018 at 1:28 pm	and is filed under Featured Post, Gem Industry News, Gemstone of the Month, Gemstones, Jewelry Services, Mardon Exclusive Jewelry. You can follow any responses to this entry through the RSS 2.0 feed. Both comments and pings are currently closed.